Big Red Truck will be at Southern on Monday! 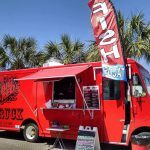 The Big Red Truck will be serving lunch at Southern’s Destin office from 11am-2pm on Monday, September 19, 2016. 10% of the proceeds will benefit the Walk to End Alzheimer’s! This is a fun opportunity to contribute to the Walk to End Alzheimer’s and the Southern team of walkers! Come out for some tacos or contribute via our team page.